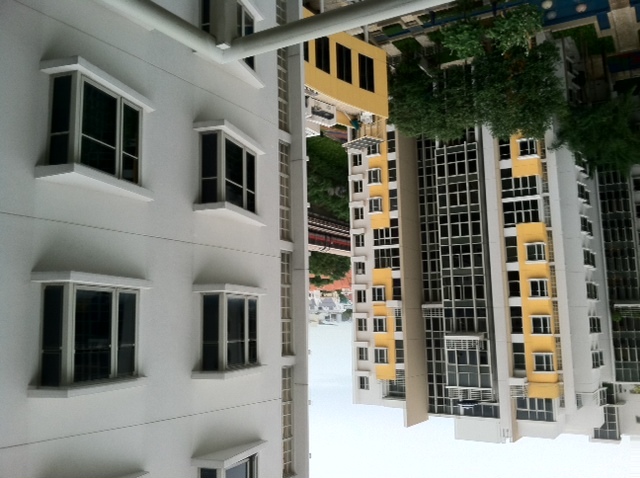 We have moved to a different apartment, way out in Simei, which brings us to another part of the island. If this sounds like an abrupt change, it is. 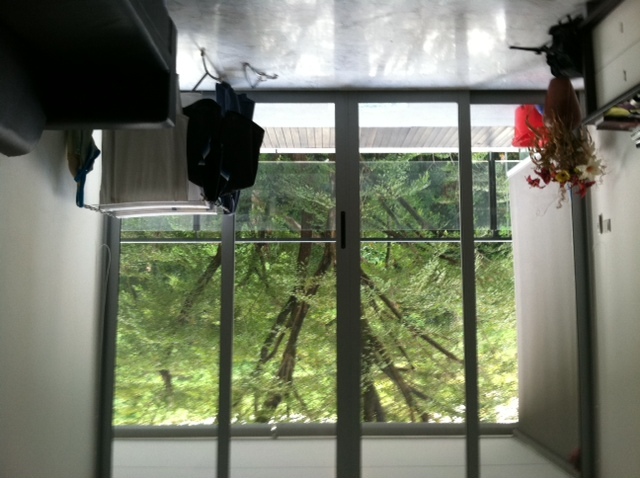 I wrote almost nothing about our old apartment near Orchard Road, because it never felt like home. Now that we’ve made our escape, I’ve been thinking a lot about what “home” means to a temporary resident. It’s partly about having a refuge from the busy streets and new experiences; but it’s also about owning up to what I like and don’t like about Singapore. Here’s the paradox: In letting loose my doubts, at least a bit, I not only feel more like myself; I finally feel less culture shocked. At first, our central location near Orchard Road seemed fun and convenient. But within a week, I’d been worn to a nub by overpriced malls, crowds, and the major construction site grinding at all hours outside our front door. Our old living room view may look idyllic here. But below those trees was the seven-lane traffic corridor of Paterson Road. I knew we were breathing in exhaust all day from cars, not to mention diesel fumes from giant cranes and backhoes. Still, it wasn’t until we made the move to Simei that I realized how much air and noise pollution we’d been engulfed by. Not that Simei is a tropical resort. It’s the urban suburbs, out east near the airport. Our new apartment overlooks the nearby subway (MRT) station, the adjacent shopping mall and food courts, and blocks of other look-alike highrises. It’s far from silent. Our unit and those around us have outdoor kitchens, so I hear dishes rattling in sinks, babies crying, washers running. In this relatively cool month, many families keep their windows open, as we did last night—with a great view of well-lit and crammed subway cars barreling into the MRT station. But the air is fresher out here. The traffic on the street below forms a steady background hum, not a constant barrage of noise. The domestic sounds of other humans are welcome after Paterson Road. 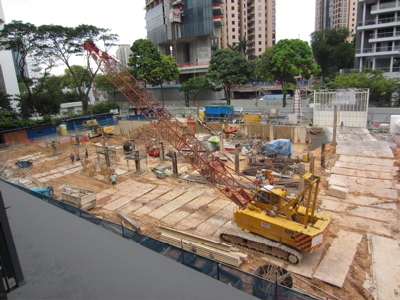 The nearest construction site is a block away, on the other side of the subway tracks. In my book, that’s a victory. In any case, I like it out here. I do! It feels like a real neighborhood rather than an expensive expat zone. During our first weekend in Simei, we visited Pasir Ris Park, two subway stops away at the end of the line. We walked through a mangrove swamp, saw a rare blue-winged pitta—and throngs of families and high school kids singing songs, skateboarding, riding bikes, eating (always eating). After my recent slam of Singapore shopping malls, Rob says I should distinguish between the Orchard Road shopping complexes, which are aimed at the wealthy—or at least a shallow vision of what you can buy when you’re rich—and our new local mall beside the Simei MRT. There’s the Curry Hopper fast-food joint (“No MSG! No Lard!”), the KFC and Burger King, a spice shop in the basement, a kaya toast cafe, the Fair Price supermarket. We’ve found the bookstore Popular and the Daiso Japanese household store in which everything costs $2. The food courts are not standouts, but they’re cheap. On at least one visit there, I’ve been gently corrected about how to hold my chopsticks. Recently, I read Simon Tay’s Alien Asian: A Singaporean in America”, a 1997 memoir by this law school professor and former bureaucrat about his time in New England attending Harvard Law School. In Cambridge, Massachusetts, he was the outsider, describing so many familiar things (to me) with a naive twist. So here I am in Singapore now, looking through the other end of the telescope at Tay’s world. Many of his observations about America are spot on, of course, especially about the status of Asian Americans as perpetual outsiders along with foreigners like himself. But what really sticks with me is his understanding of how Americans need and expect open space. I am owning up to that need now. 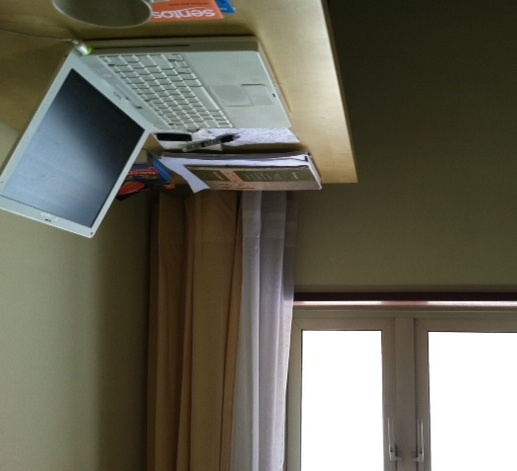 Probably my favorite thing about Simei is our extra bedroom, which has become my very own office with a door that closes. As always, I watch the clouds. Sitting at my new desk, they fill the windows to my left. In the kitchen, I feel the humidity in the air when I’m brewing my first cup of coffee in the dark, the rain pattering as it was this early morning. At sunset, when the house swifts flutter between the apartment gratings, night comes down fast, leaving behind a few golden streaks. Time can pass so slowly. But then it speeds up, and suddenly I’m grabbing at seconds as if they’re subway cars that never, ever stop. I had a moment of confusion when I first saw that second photo. Wait a minute. That train can’t be leaving. It’s on the right-hand track, so it must be coming in. Then I remembered. British Commonwealth country. Trains as well as cars drive on the right. The American need for space is deeply tied to our notions of personal freedom. I’m sure you remember from high school civics the saying that your freedom to swing your fist ends where it meets my nose. We all learn it, but nobody follows up the implication: that other people restrict your rights just by being nearby. There are also more practical political repercussions. In both Asian and Mediterranean culture, people learned to live crowded together for household and community self-defense. Our enormous degree of individuality requires elaborate protection from bandits and invaders, so we end up with huge military and police forces. That those forces are also used to keep the poor in line and interfere in other countries’ internal politics is almost secondary. Their first duty is to provide us with the luxury of space. Drive on the right? Oops. I meant the left. The other side from us. This post left me speechless. I think it’s the image of the uber-neat desk….. but seriously, I’m glad you have settled in and found a place where there is both space and time you want to hold onto. Ah, yes—the clean desk! But that’s another nice thing about being away from my normal office. (And, yes, Joan, it’s British driving style here.) Thanks to both of you for your good wishes. I read your interesting blog and saw the photos you posted which I believe you must be staying at Modena. 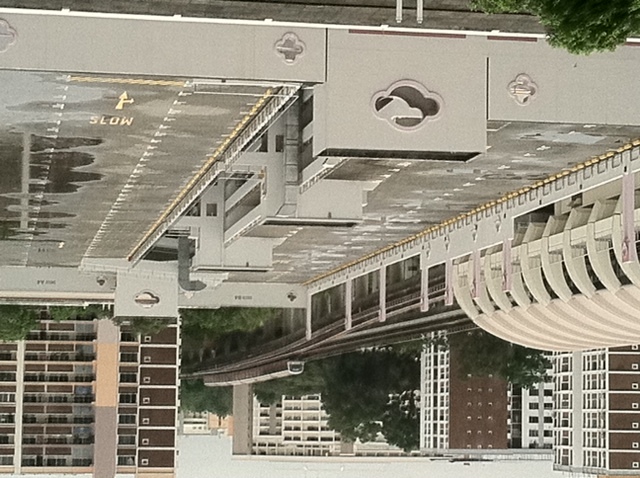 I am also staying at Modena Block 35. Maybe we could meet to exchange some stories of Simei and Modena. Hi Patrick –Yes, we were staying in Modena! We’re back in Boston now, although we will be heading to Melbourne, Australia, next spring for another sabbatical. Do you like the Modena in Simei? James Seah reports that the Eastpoint mall is now being renovated, which might change my POV of the noise 🙂 The renovation will probably be nice, but, like any human, I’ll miss what I liked so much before. Hi Martha, many thanks for the reply. We stayed in Modena for around 10 years now and love every bit of it. My children refused to move out of the place when I proposed to sell the place since I can fetch a very good price for it. So we are still here in Modena, a convenient place to be in. We miss Eastpoint alot and could not wait for it to be ready around end of this year. Have a great trip to Melbourne and all the best.